Decluttering is all about discarding! Is it Chinese New Year soon?!! Yay to decluttering! I've been so bogged down. What else, but kids. In midst of trying to upkeep my motherly roles and duties, I've been trying very much to keep the house in good order. That is, to tidy and declutter. With a determined mind, I am crafting our space to be more peaceful and comfortable. Not sure about you, but I get a terrible headache by the sight of clutters and items without a 'home'. I got really serious and embarked on a reading journey with Marie Kondo's book, The Life-changing magic of tidying up - the Japanese art of decluttering and organizing. She's one sensational consultant who coaches on the magic of tidying. When I first read about her, I had reservations as she probably doesn't know what she's writing from the aspect of living without kids. Decluttering is for anyone, regardless of age. I had the kids on board our tidying journey. The book recommends that before we move onto tidying, we should discard whatever that doesn't spark joy to us. That is, hold onto each piece of clothing, toy or memento, and ask yourself if this item truly sparks joy and whether it deserves a keeping space in the home. Keeping items for the sake of "just because" doesn't give it a strong reason for staying. We began with the rooms. All in the recommended sequence, clothes, toys, books, CD/DVDs and papers. Moving onto shoes soon. Before tidying, we gathered each category separately, and from there trashed out, almost intensely, a total of 15 garbage bags of clothing, toys, books and of unwanted stuff! Clothes were sieved out by my Grandma's helper to bring home and toys were mostly donated or sold on carousell. A great way to cash out your preloved items. And sometimes, you feel better that someone will pay for what you have truly treasured. It seems easier to let go this way. These are 2 bags left of clothing for our friend to bring over to Cambodia. I reckoned if I needed to keep the kids room in a tidy and clutter-free manner, I do need their involvement. That's pretty much of how Js spent their December holiday. Jazz's wardrobe is still spilling with clothes that she had to keep discarding and get more serious about keeping clothes that truly spark joy. Mum's fault, I know. For buying too much clothes. It's true, raising daughters are more costly. Not much of a choice, she borrowed space from her brother's wardrobe, next door. After which, we folded the clothes with Marie Kondo Method. Her key is to store things standing up rather than laid flat. Here's how we folded most clothing. First, fold each lengthwise side of the clothing toward the centre (such as the left-hand, then right-hand sides of a shirt) and tuck the sleeves to make a long rectangular shape. Next, pick up one short end of the rectangle and fold it toward the other short end. Then fold again, in the same manner, in halves or in thirds. The number of folds should be adjusted such that the folded clothing fits the height of the drawer when standing. I've to say we really love this method of folding. It's a pity that we took this long to discover this method. It allows us to at once, glance at the clothing we have and not miss an opportunity of neglecting any piece. These were almost tough to sort because every piece seemed to spark joy among them. And for having kids of varying age, we keep a huge range of toys. Mum's fault again, for getting too many toys. But seriously, we've cut down much on toys buying. Most were blessed or gifted on their birthday. Which is one major reason why I often spend much time and thoughts on gifting. So then, even after a massive sweep, the toys are still very much invading their room space. Different gender attributes much to the toy collection too. It ranges from cars to princess plays. In fact, the older kids are spending more time in school and gradually less time for their toys at home. It is wise to only keep toys that they really love and look forward to play after school and over the weekends. Loose and free toys that comes with meals or food packaging are such a pain. We discarded a big lot of it. We sorted the books which was another headache as Js love books. Still, we managed to sieve out some that doesn't spark anymore joy. Brought them to the books exchange corner at the library, in hope to give the books another life in a new home. We slowed down in buying books, and instead, visit the library more often. Some books have sat on my shelves for years without being completed. I knew that 'later' or 'another day' is unlikely to arrive. I swept those books off my shelf for the books exchange corner too. Lastly, we sorted papers. I am one Mum who treasures much of what the kids have created at home or in school. Their room has got crafts, doodles, drawings and papers laid around. I treasured them so much in the past that I would stick every creation onto coloured paper to create something like a lapbook. That very day, we went through every piece, from the littlest doodle to their nicest drawing, most pieces don't spark joy in them anymore. Discarding them was a green light and it did feel lighter for having a big space freed up. If the creator didn't mind me discarding, I should not mind too. And of course, they kept a few pieces that they really loved. I've to confess, even after a mega wipe out, their room still look much intense with toys and books. I attribute this to the fact that I have 3 kids, and their room is the only space we keep most toys. There's still much work to go in our rooms and common spaces. Not only it's a massive project, it is extremely time consuming. You do need to set aside much time for a mega project like this. And of course, with a changed mindset of not hoarding. 1. Buy things more carefully and consider carefully where it should be kept in the house. 2. Don't buy meals or food just because of toys. 3. Retract from being a typical Singaporean, going and queuing for freebies. Which most times, the stuff given are deemed unnecessary. We should get picky about freebies too. 4. Some hobbies require the space for storage. It really is quite a consideration before plunging into a series of hobby collection or activity. 5. If we designate a space of each item, we don't have much problem with clutter. 6. Don't stack. Instead try storing things vertically up, where you have good view of everything. 7. When you buy something new, use it soon! Most times, we keep till forgotten. Or if not, buy only when needed. 8. Believe what your heart tells you in sparking joy. 9. Space is valuable. Keep only the precious. 10. In our ever busy days, 'later' or 'another day' quite means never. DISCARD. Though much have been reduced in the process of tidying, we have yet to come to the point where we know it's just right for us. More needs to be reduced. We do need more room and space for comfortable rest and really enjoy being home. This is just progress of the kid's room. There's just so much about decluttering! And perhaps, another post for progression in other areas. This coming season of spring cleaning, are you looking to only rearrange and maximize space, or discard and store items that only spark joy? Things that stay should be worth a keeping space in your home. I think we have come to a point to only possess the things we need and really love. A classic fable from Aesop... 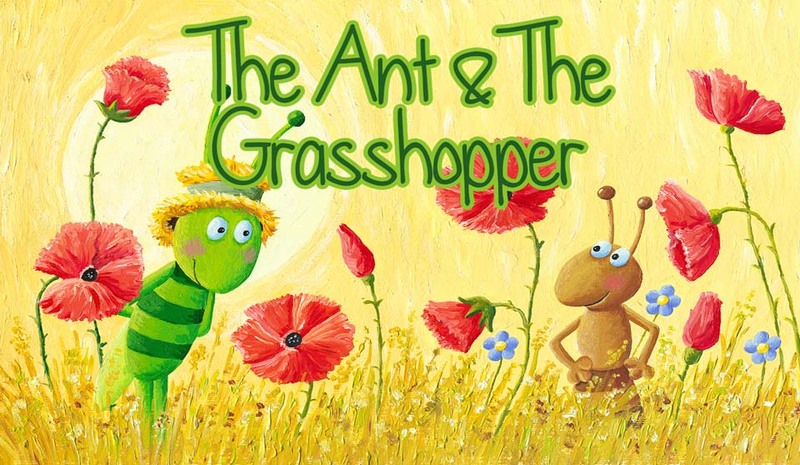 The Ant and The Grasshopper make a return! Once there lived an Ant – a hard-working and ever-busy Ant who never seemed to have time for play or relaxation. And then there was Grasshopper, with time on his hands and nothing much to do all day. And visiting from time to time, there was Caterpillar! Somehow they were friends. All day long Ant would work hard, without stop or rest, collecting grains of wheat and storing them carefully in her larder. What will happen to Grasshopper then? What exactly will Ant do? And where will Caterpillar go? Come join itheatre for another fast-paced and interactive production, specially created with the younger audience in mind, but with unexpected twists and turns to keep even the grownups engaged, involved and on their toes! In the original Fable by Aesop, the ant work all day, never taking time to appreciate the world around them. Whilst he Grasshopper does not see the value in working. There's much to their perspectives and I am sure we can learn something from this tiny insect world! 3. Like and Tag on this Facebook post, 3 or more friends whom you think will be keen on this giveaway. 3. Tag in the comment section of this Instagram post, a friend or more whom you think will be keen in this giveaway. One tag per comment. The more you tag, the higher your chances! You don't have to, but sharing is caring! And yes, you may try your luck with both handlers. Giveaway closes on 20 Jan 2017, 2359hrs. Best of luck!